E.B. Harris knows one man doesn’t determine value. But with his farm in Warren County, statewide auction business, and connection to markets worldwide — agriculture in North Carolina wouldn’t be worth as much without him. He pulls his glasses off his nose, folds them, and tucks them in his breast pocket. He locks his phone and puts it in the pocket, too. It is a Tuesday in late June. This coming weekend, Harris, the biggest name in auctioneering in North Carolina and one of the biggest on the East Coast, will serve as the passage point for 150 cows and 40 pieces of farm equipment. For a few short seconds, the livestock and items will be in his possession, held in limbo between the seller and buyer. What he says in those seconds determines the sale prices, and the sale prices become sample sizes of the total mega-business of agriculture. The value of farming hangs on his words. He carries this responsibility like a weight. Harris is no small-time auctioneer. Most of his sales top $250,000 in total volume, and many easily eclipse $500,000. He conducts about 40 sales a year. He sees millions upon millions of dollars changing hands every year, all agriculture dollars. He lives on a sprawling farm in Warren County in remote northeastern North Carolina, but his reach stretches beyond that. He thinks about the world globally. He’s built a 40-year career on an extraordinary ability to foresee how one thing determines the value of another. That drought in the Midwest is the worst in 50 years. It comes at a time when China needs more hay and corn than ever. It comes at a time when people in the United States are out of work, and they need cheaper food prices. They’ll eat more hamburger and less steak. The top cuts from the top cattle Harris sells are more likely to feed someone overseas than they are his neighbors. Harris’s cell phone is mooing again. It’s 10 a.m., time for the morning grain-price update. The first figure captures his attention. It is late June, and corn is at $6.02 a bushel. “It was $5.76 yesterday,” Harris says. Farmers in the Midwest are plowing under fields of scorched corn. Corn is the root of agriculture prices. Consider a steak: The steer from which that steak was cut eats corn feed. If the farmer who owns the steer spends more money on corn feed, the steak costs more. America needs corn. And if it doesn’t rain soon in some place 1,000 miles from here, corn prices will keep going up, and farmers worldwide won’t be able to afford to feed their cows, so they won’t buy more cows. Three days from now, Harris will stand in front of a crowd and auction off 150 cows and 40 pieces of farm equipment, with the weight of the farming world on his mind. This sale is an important one. The morning portion will be an auction of cattle from various farms in eastern North Carolina. The afternoon portion will be the equipment. It will take place in Clinton, in Sampson County, one of the state’s largest agricultural counties, at the George P. Upton Livestock Arena, named after George P. Upton, who worked for 54 years as an agricultural extension agent and did as much for farming in eastern North Carolina as just about anyone. This is the auction of George P. Upton’s farm equipment. Upton is in his 80s now and retired, and he doesn’t have use for it. The day of the sale, Upton’s working life will be spread out in a field, all the farm equipment that made him a farmer splattered in the sun for someone else to take with the highest bid. Among the items are two tractors. One is a 1973 Massey Ferguson, a rough-riding machine with red paint that helped Upton grow his farm. Upton remembers putting his daughter, Erica, up on the seat and teaching her to drive. The other tractor is a modern-day Case, with a high-sitting, closed-in cabin and air-conditioning. Upton used this tractor, a big, red showpiece, in his final years of farming. Both tractors mean something to him, for different reasons. Upton has lived to see this day despite waning health. He’s lived to see his farming life sold. He wouldn’t have anyone sell it but Harris. Years ago, Upton told his wife, Mary, that if anything should ever happen to him, she should call Harris first. Harris and Upton have only met a handful of times, and Upton trusts him with his life’s work. He sells about 500 head of his own cattle every year. The average cow he sells off of his farm goes for $1,900. Two hundred dollars worth of that cow — whether it’s the liver or a fillet — goes to someplace overseas. Harris’s home was built in 1857. It is a boxy, two-story structure with four rooms on top of four rooms. The first owner, John Buxton Williams, hid dozens of hams under the second-story floorboards when Union soldiers came through and tried to take the family’s meat. Williams invested in the Confederacy and lost most of his assets in the Civil War. The home sat empty for 40 years until Harris’s grandfather bought it in 1916. On the day of the move, Harris’s dad, just 6 years old, walked the family cows 12 miles from their previous home in Louisburg to here. It took eight coats of paint to cover the grease stains on the first-floor ceiling from those hams. Harris was one of three children born in the home. In high school, he drove a bus. He saved $2,400 by graduation and called himself rich. He sat in study hall behind a girl named Anne. She grew up in the nearby town of Warrenton, and she wouldn’t talk to the farm boy. He graduated and went to work three years later at the stockyards in Rocky Mount. One Sunday, while at an intersection, he saw Anne and waved. She waved back. He turned around and went to her front porch. She finally talked to him. They married in 1971. An auctioneer at the stockyards told Harris he should get into auctioneering. Anne paid for his plane ticket to Arkansas and auctioneering school. The auction life made sense to him in ways that other things didn’t. At an auction, the price isn’t set beforehand. The customers determine the value of something based on their level of need. Harris’s auctioneering business started with a consignment sale in 1974. By 1976, he was conducting a dozen sales a year. Today, he’s one of the most important hinges of agriculture in an agricultural state. He also farms for himself. He breeds cattle like crops, trying to make the perfect beef. He’s stretched the farm enough that he now owns more land than any single person in Warren County. He never says how many acres he has. He keeps the tracts divided among trust funds. He doesn’t want anyone to know how much he has because it doesn’t matter. He considers two things immeasurable: the value of his property and the value of his name. He’ll never sell either. 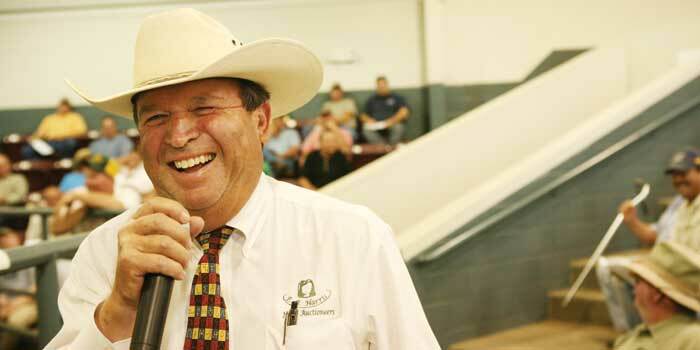 Eli Detweiler is a world-champion auctioneer. He lives in Ruffin in the northern Piedmont. In 2010, Detweiler beat out 200 other competitors for the title. An auctioneer doesn’t just talk fast; he fills the space between the numbers with words. Detweiler does this better than anyone in the world. And he works for E.B. Harris. Harris is good at calling bids, but he’s not a competitive caller. He’s a businessman. He employs four or five different callers on the day of the sale, looking more like a coach at times than an auctioneer. Honesty, he says, is more important to his brand than anything. Harris puts guarantees on pieces of equipment. Once, he sold a tractor. Within a week, the man who bought the tractor called and said he was stopping payments because the transmission went out. Harris called the seller, and, with Harris mediating, the buyer and seller worked out a deal to fix the transmission for $5,000. Everything in life is an investment, Harris believes. Today’s value, he says, is today’s value. But it will change. A negative today can be a positive tomorrow. Consider a rain suit: On a sunny day, Harris says, it might be worth 50 cents. On a rainy day, he says, it might go for $20. So when people approach him before a sale and ask for inside information — What’s it worth, E.B.? — Harris never estimates. Need and desire determine worth, not the auctioneer. Auctions have a theme. The silent auction serves the crowd at a banquet dinner. An estate auction releases a grandparent’s old crystal to someone else, saving it from burial. A police auction places a criminal’s accessory innocence in the hands of a new owner. The buyer determines the value of that car or that crystal. The farm auction takes global needs and puts them on display in a country pasture. It’s a safe bet that everybody in the world has eaten something from a farm. It’s also a safe bet that most farmers in the country have been to a farm auction at some point. In 2010, North Carolina was eighth in the country in agricultural income. The state has more than 400 auctioneers registered with the Auctioneers Association of North Carolina, and aside from the weather, those auctioneers may play a more pivotal role in the value of farming than anything. It is Harris’s job to make sure the industry churns. He is mindful of every farm in the world, his empathy encompassing every grain that grows from seed. In the week leading up to the auction in Clinton, he brings in a veterinarian to give pregnancy checks to every cow. He talks to each animal. He drives every piece of equipment to make sure it runs. For need or for want, we choose the things we care about, choose the value we place on every relationship we have. To Harris, those cows and that equipment are the most important things in life outside of his family. On the morning of the auction in Clinton, Harris walks into the arena with a cordless microphone in his hand and a big cowboy hat on his head. The emblem for E.B. Harris Auctioneering is a cowboy hat, and, if you look closely, Snoopy’s face hides in the middle of the design. Harris speaks into the mic. He recognizes the veterans, and he leads a prayer, thanking God for producing the food and feeding the world. And then, he’s off. Three Angus cows thunder into the arena with their newborn heifer calves by their sides. Harris thinks these are the best cows of the day — they’re young, and the calves are only their firstborns. That’s why he put them here at the top, to set the standard for the day. The cows run back and forth, banging their heads against the gates, and Harris starts the bidding at $2,500. Nobody buys; he drops the price. When a later group of cows comes in, Harris tells the crowd exactly when they’re supposed to give birth — February. Over the course of two hours, Harris is funny and polite and stern and convincing with his words, and those words fall in between numbers that add up to about a quarter-million dollars worth of cattle. Fifteen years ago, E.B. Harris was preparing for a sale. He lists all the items he’ll sell by taking out ads in the local newspapers. He got a call about a hay rake. The man wanted to buy the rake, but he couldn’t attend the sale. So the man gave Harris a dollar figure he was willing to pay, and Harris assigned a member of his staff to conduct the man’s bidding. The man was George Upton, and he got the hay rake. Fifteen years later, that same hay rake sits in a field outside the George P. Upton Arena, ready to be sold again. Following behind the truck is a black SUV. George Upton rides in the passenger’s seat while his daughter, Erica, drives. Erica grew up on her dad’s farm. She remembers driving that old Massey Ferguson. She remembers the hay rake. She now works on the North Carolina Agribusiness Council. Most of what she knows about her dad, most of what she knows about her upbringing, lies in this field. The two most noteworthy items are those tractors — the old Massey Ferguson and the modern-day Case. Harris leads the sale of the Case, and it brings $28,500. Upton watches closely from the SUV. The auction truck drives forward and pulls up beside the Massey Ferguson. The SUV pulls forward and pulls up beside the auction truck. Harris hops on the old tractor and cranks it, proving that it runs. It brings $2,700. After the sale, Upton meets with Harris to collect the money. And the retired agricultural extension agent thinks about which tractor he watched more closely, which sale he was more interested in — the red one with the air-conditioning and all of the modern amenities, or the old one, the one that helped him start his farm, the one he hoisted his daughter upon and watched her learn to drive, the tractor that gave him his farm life 40 years ago? Which sale did he watch more closely? Upton doesn’t need long to decide. “The big, red one,” he says, laughing. A little more than a month after the Clinton sale, on the first Sunday in August, Harris invites the people closest to him over for a picnic underneath tall, white oak shade trees at his home. About 200 people show up each year. He serves barbecue pork, beef, and goat. Guests fill another two tables with sides — deviled eggs, potato salad, macaroni, beans. Before the meal, Harris takes the microphone, wearing a suit with a button-down shirt made in China, and he honors the veterans and leads the pledge of allegiance. A friend leads the prayer, thanking God for the sunshine and the rain, and then everybody eats. Harris doesn’t touch a plate. He walks from table to table, and for two hours, he talks. He’s not selling a thing today, just playing host. Detweiler, the world-champion auctioneer, brings his wife. All of Harris’s farm hands are here. Harris’s son, 30-year-old Shane, with a downward-growing red mustache and an upward-growing reputation in the auctioneering business, helps shake hands, too. Shane is Harris’s only child. He’ll take over the farm and auctioneering business one day. It won’t go to anybody else. In the distance, to the west, beyond the white oaks and the cookout, is one of Harris’s many cow pastures. A bull is grunting. Beyond that, farther west, a stand of trees. Beyond that, another cow pasture of Harris’s. Beyond that, a timber field he planted. Beyond that, corn. Beyond that, farther west, the rest of America. It’s on his mind, that land out there. That drought in the Midwest has grown worse in the past month. Corn, which was $6 a bushel the week of the Clinton sale in late June, is now $8 a bushel in early August. The price of feed is up throughout the world, and fewer farmers are buying cows. So Harris, who has an abundance of feed products on his sprawling farm, has decided to do something he hasn’t done in 40 years of farming: He won’t sell his own calves this year. He’ll keep them through the winter, feeding them for another year, growing them an extra 300 to 400 pounds, until next summer. Then, he believes, he hopes, and he prays, the Midwest will have a resurgent corn crop, and farmers around the world will buy feed at cheaper prices, and they’ll buy more cows to feed. And Harris will have cows to sell them. He’s built a career on an extraordinary ability to foresee how one thing determines the value of another, and he’s anticipating a change next year out West, beyond those fields, beyond this drought. He’s betting that today’s sunshine will bring tomorrow’s rain. Michael Graff is the writer-at-large for Our State magazine. His most recent story was “Hazel” (August 2012).